Established in 2007, Tokyo Midtown Design Hub has continued to hold various events to promote the possibilities of design to the society. In order to connect design, people and their domains, disseminate the possibilities and power born from the connection and develop them further, it has held over 50 exhibitions, seminars and workshops, widely known as the source of design information. “◯◯◯ mo ◯◯◯ mo ◯◯◯ mo: ◯◯◯ can also be considered ◯◯◯” is the sequel to the 2013 exhibit, “( ) mo ( ) mo ( ) mo exhibition – Design and ways of seeing –” which received broad attention for its unique guest creators and their distinctive artworks. The display this year exemplifies Design Hub’s policy of “connect, spread and develop through design” with creators’ cross-domain perspectives, expressions and messages. The creators will also hold workshops during the exhibition period. 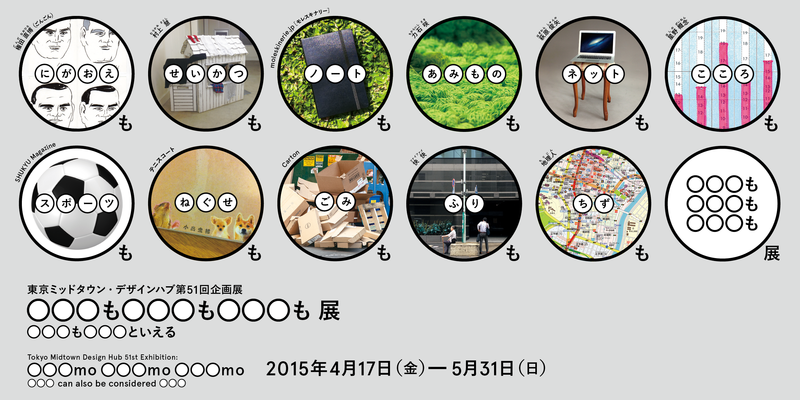 Tokyo Midtown Design Hub will hold the second “( ) mo ( ) mo ( ) mo exhibition” (“mo mo mo” exhibit, for short) which helps you discover elements of design in things that seem far from it. For the second show, titled “◯◯◯ mo ◯◯◯ mo ◯◯◯ mo – ◯◯◯ can also be considered ◯◯◯ –,” professionals from various fields express charms of different domains using the techniques of their specialty. Different perspectives enrich understanding and different techniques enable unique expression. Please enjoy the creative works by eleven professional individuals / groups, likened to side-to-side steps in design. Special one-day event “◯◯◯ mo ◯◯◯ mo ◯◯◯ mo junior high school” (momomo junior high) will be held to coincide with Roppongi Art Night. Frontrunners in various fields, including the exhibitors, will become teachers in charge of subjects close to their domains and offer original lessons. Cardboard boxes abound in the world. Their main purpose is to “carry” items, but a close look at the inorganic design reveals its uniqueness. But the charm of cardboard boxes often go unnoticed, as they are casually discarded. Something commonly overlooked may become object of interest, I hope. With the publication coming in May, the editorial department of the new soccer journal “SHUKYU Magazine” will be open to the public. Originally started as something playful, soccer gradually became professional sports with rules and informatization. A close look at the sport and the spherical ball will give you new perspectives on the future of soccer. I was looking at a guidebook of knitting patterns and I noticed that a particular pattern looked like a human nose. That’s how this project began. Gathering patterns that look like eyes, hair, moles and pupils, I put them together to make faces to be installed in towns. But with limited patterns, the faces looked the same, so this time, I studied more facial parts in order to display at the venue different faces full of expressions. The Nagomuru City, with the population of 1,560,000 people, is located approximately 30km south of the capital Saikyo. But it is an “imaginary city,” nonexistent in this world. It is far from the ideal that people may have, with no particularly remarkable characteristics or sights – if anything, it is ordinary. I express the atmosphere, reality and universality of such common town in detailed maps. As an elementary school student, I encountered it at the toy corner of a family restaurant. It was a toy of Gyopichan, from the popular anime “Goldfish Warning!” It was supposed to voice “Gyoppiiiiin” when placed on a palm. Excitedly, I put it on my palm. But it was running out of battery. It groaned so deeply that the voice sounded as if it came from devildom. Scared to death, I flung it on the ground. Peekaboo is the play based on the shared agreement to enjoy the dramatic “pretense.” We have collected the day-to-day casual “pretense” movements and communication to point out the dramatic elements in them. We provide collection sheets for you, so please enjoy discovering the “pretense” in life. Psychology tests to analyze the characteristics of “the mind”– their results are presented in the mixture of elements based on various scales. The mixture differs from person to person. If the scales are replaced by sounds, the mixture will be different kinds of music. I want to listen to the music of my “mind” and compare it to that of other people — that is what I attempted to do at this exhibition. With my mobile house, I visit different towns in Japan, asking people for permission to station the house in their premises, sleeping there and drawing the floor plan, assuming nearby public bathrooms and bath houses as “the bathroom of my house.” At this exhibition, I will display the floor plans and also build a bedroom, assuming Roppongi City as my own house. How do people use such a simple notebook as MOLESKINE®? What do they write on such an enormous blank space? Notebooks are usually very personal but we are going to display the result of the research on how people use them.